Requirement: SharePoint Online Get All User Profiles and export to CSV. How to Get All user Profiles and User Profile Properties in SharePoint Online? A user profile property is the field that holds user data such as "First Name", "Last Name", "Department", "Skills", etc. By default, SharePoint already has a rich set of user profile properties. 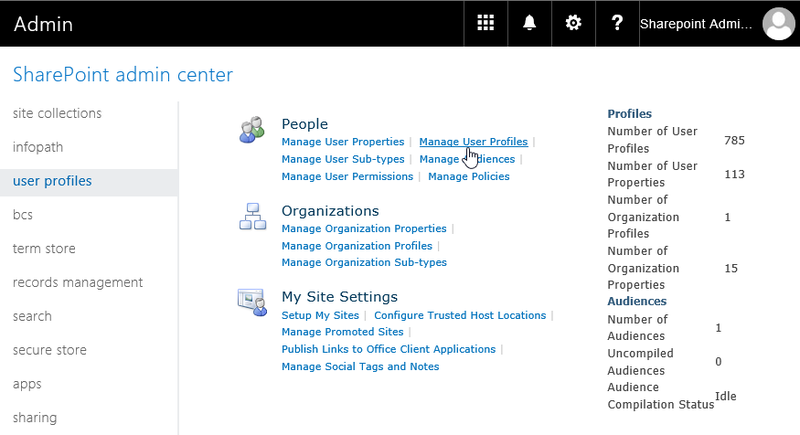 In User Profiles, Click on "Manage User Profiles" under People tab. Use Search to get the user profile of the user. This interface helps us to get individual user profiles and properties one by one. Lets use PowerShell to get all user profiles in SharePoint Online. This PowerShell gets the specific property "Department" of the particular user from given site collection. Add-Type -Path "C:\Program Files\Common Files\microsoft shared\Web Server Extensions\16\ISAPI\Microsoft.SharePoint.Client.UserProfiles.dll"
This PowerShell gets the particular property of a specific user. Similarly, you can get any available user property such as Email, Manager, etc from the SharePoint Online user profile using PowerShell. I have used the above script in the past, to get list of users and their custom properties from SharePoint Online USer profiles. But now I have been getting 'Error Exporting User Profile Properties! Exception calling "ExecuteQuery" with "0" argument(s): "The sign-in name or password does not match one in the Microsoft account system."' after enabling 2-factor authentication.